check below for some of our favorites! 2. Add scoops, tubes, flashlights, clear containers etc. 4. See how they’ve changed, roll them around, hammer them, squirt warm water on them and see what happens! 5. Squeeze your stress away! 3. Roll the beads around and create a masterpiece! 3. Hammer the beads and watch them bounce and fly! 3. Slowly add the liquid starch while stirring. Keep adding it, a little at time, until the mixture begins to stick together and congregate in the center of the bowl. Continue stirring and adding starch until bits of the goop no longer sticks to your fingers when you touch it. 4. 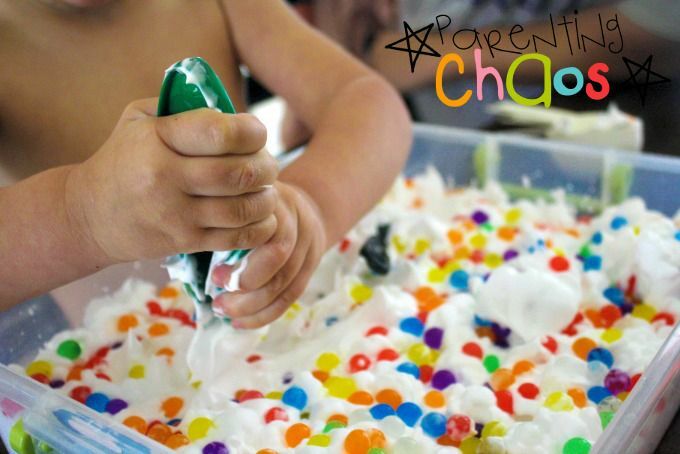 Once the water beads are fully hydrated, add them to the slime and knead. Some will break loose and bounce away, so make sure younger siblings are out of the area. 2. Fill the sandwich bag with water beads. Press the air out and seal. 3. Place the first piece of tape along the top and tape to the window. 4. The other four pieces of tape will be slightly tricky. Use a window squeegee to hold the water beads out of the way as you tape down the other four sides.